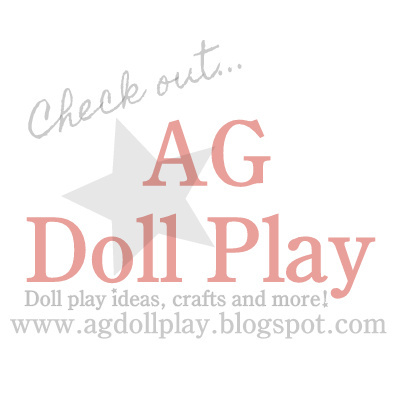 American Girl Doll Play: A Giveaway from Furrowed Stitches! A Giveaway from Furrowed Stitches! Today's giveaway is a special one because it's from our blog contributors, Misty and Ruby! Misty is a seamstress in her "real" life and has an Etsy shop which you can find here. She loves to re-purpose things and that love finds itself in her sewing as well. She makes headbands for women and girls made out of old recycled t-shirts, makes stuffed wiener dogs and stuffed snakes using recycled scarves and ties, among other things. Is she giving away a headband or one of her stuffed animals on a doll blog you ask? No way! She also has been making some adorable fairy accessories for dolls here and there and she is going to be giving away two sets here on the AG Doll Play blog. Thank you so much Misty! Here is a photo of Zoey's fairy set that she was given by Misty awhile back, (Zoey made the fairy wand using a coffee stir stick and some foam stickers). 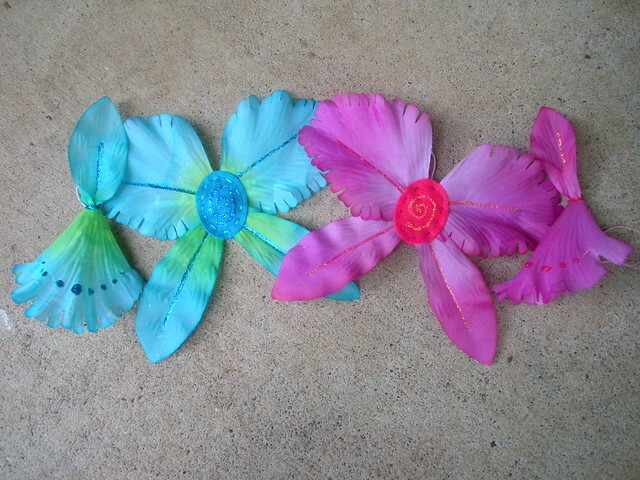 Included in each set that is being given away is a pair of delicate doll fairy wings and a flower oetal fairy hat. Here are the details for the giveaway...we will be choosing TWO winners so there is more opportunity for you to win! 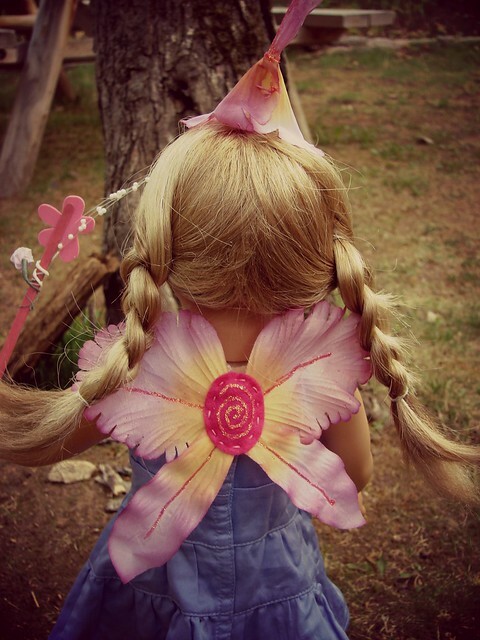 Share here in the comments section (of this post) what doll would love to own a pair of fairy wings and why. "Like" Furrowed Stitches on Facebook as well and introduce yourself and share that AG Doll Play sent you! That's it! Pretty easy to be entered into the drawing. Two random winners will be chosen from all those individuals that do the above and will be announced here on Wednesday, August 7th, 2013. Please note that this contest is open to US residents only...thank you for understanding. THANK YOU SO MUCH MISTY FOR THIS FUN GIVEAWAY! If you are interested in purchasing a fairy set for your dolls please contact Misty directly by emailing her at: misty.valadez(AT)yahoo.com. She charges $10 + $2 for shipping. 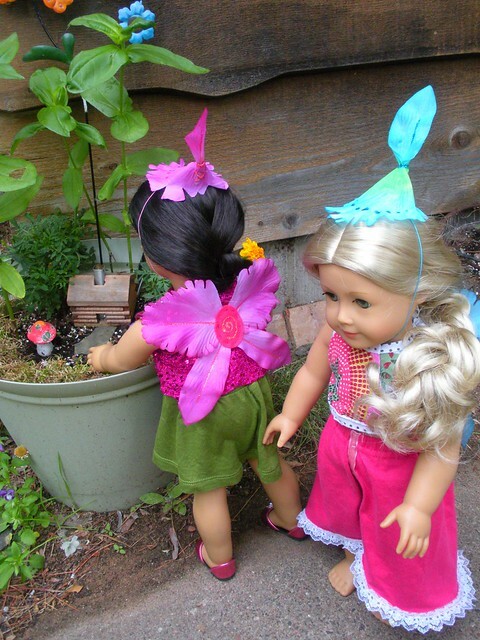 I have two dolls Ivy and julie, they would both love fairy outfits. They don't have any costumes at all yet and I can't think of a better one to sart with then fairies. 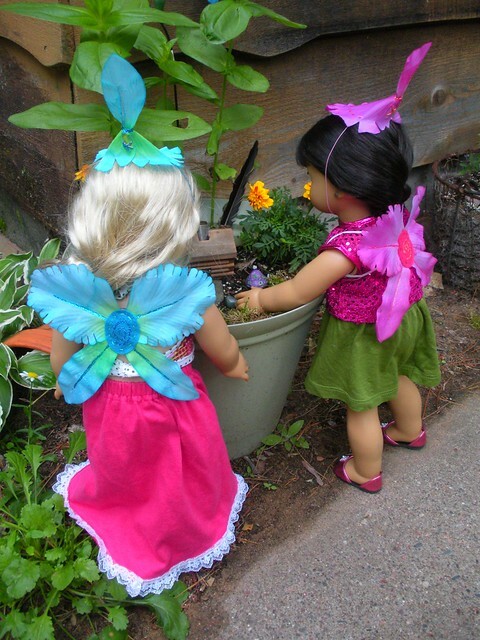 Fairy wings would look great on either of your dolls!! So fun, thanks for sharing! We have a varied collection of Liberty Landing dolls, Madame Alexander, and American Girl. We JUST got Molly and Emily this past weekend and we think they would be awesome in fairy wings. My daughter loves to have princess parties and dress up time with her dolls. I think fairy wings woukd be a fabulous addition to our collection. I like you on FB and am going straight to Furrowed Stitches to like. Thanks for the giveaway! Thanks Kristi!! Sounds like your daughter is a very lucky little lady! Good luck and thanks for entering! 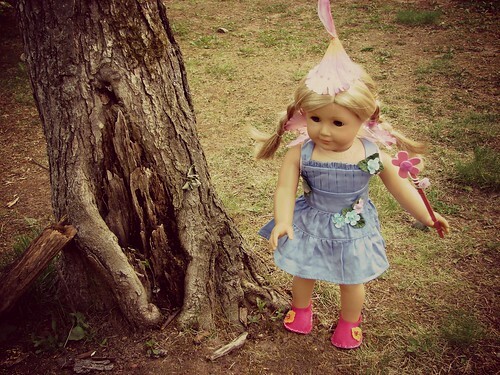 I have 2 American girl dolls,Saige and Elizabeth#57!I think Saige would look absolutely gorgeous in fairy wings!Thank you for the giveaway!! It would be so fun to see Saige in some fairy wings, I agree! Thanks for entering! Please view my blog: itsadollworld.wordpress.com! I will give you the link in a different comment! My Dolls want a fairy wing set for Halloween! I have 2 AG dolls, Molly and Heather (#42). They need it because all the outfits and accessories they have are this colorful dress, pajamas, and their meet outfits.